Head to the city centre, and it’s unsurprising that you’ll be faced with numerous chain bars from which to choose – Wetherspoons, Walkabout, Slug & Lettuce, Revolution…but thankfully, in amongst the places that are carbon copies of those you’ll find on every UK high street, there are some proper pubs too. Don’t get me wrong – I’ve had my fair share of nights out at some of the places I’ve mentioned above – but sometimes you just want to while away your afternoon in more of a traditional boozer and enjoy a bite to eat. Horts – a Young’s pub on Broad Street – has an amazing history, which you can read about here. 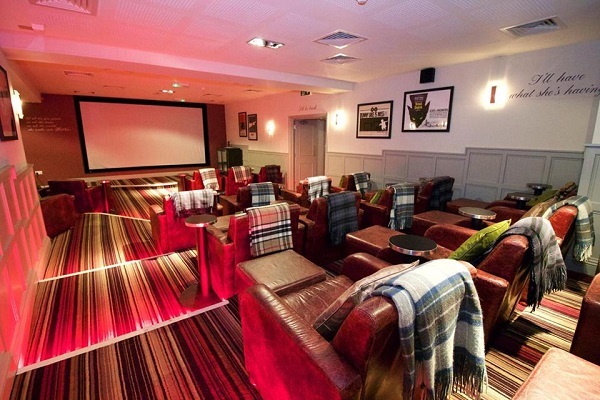 It’s still got very much of a traditional pub vibe to it, but there’s far more to the place than initially meets the eye…since a £300k refurb back in 2013, the place is home to a 26-seat cinema showing a free movie every Wednesday night, which is also available for private hire. Decor and layout-wise, Horts has a traditional pub feel but with contemporary touches throughout. It’s a big place, with a variety of different seating areas, some of which have visibility of the screens dotted around the pub to show live sports. Head to the bar and you’re faced with a dizzying amount of choice – including a huge variety of wines and fizz, an impressive display of gins and whiskies, and a decent range of beers and ciders sourced from both locally and further afield. 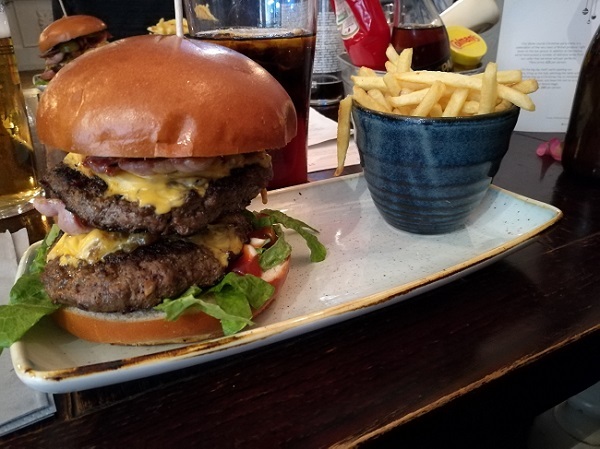 Having had a late lunch and no evening meal the day before, we were both starving…so the double stack cheese and bacon burger (£14.50), served with fries, was the only way to go. The presentation was great – the fries served in their own china pot, the burger looking decadently tempting – but I’d have loved some kind of salad on the side. The burger itself was decently seasoned, if a little overdone, but Horts had skimped a bit on the cheese – especially considering the price tag. The brioche bun tasted great and held together nicely, and the pot of chips was generous, nicely crispy and not too salty. The atmosphere in Horts is lovely – chilled and friendly, a great place to escape from the city centre hustle and bustle. Price-wise, you’ll find cheaper pub grub (if you haven’t yet been to the nearby Bank Tavern, you’re missing out), but it’s a family-friendly – and friendly overall – place that’s steeped in history, and that’s always a reliable shout for a meal or a drink in town.